Merton Council is calling on residents this Recycle Week (22-28 June) to cut the amount of waste they generate and to reuse and recycle whatever they can to minimise the amount of rubbish that ends up in landfills. Council staff will be on hand in the civic centre for the whole week, providing recycling advice to residents from 10am till 2pm. This year’s campaign focuses on the opportunities to recycle items from all around the home, not just the kitchen, where most people who recycle divide up their rubbish into the black sacks and the recycling boxes provided by the council. Many people regularly recycle plastic milk bottles and glass bottles from the kitchen, but don’t recycle shampoo bottles, deodorant containers and toilet rolls which end up in the bathroom bin and then general waste. 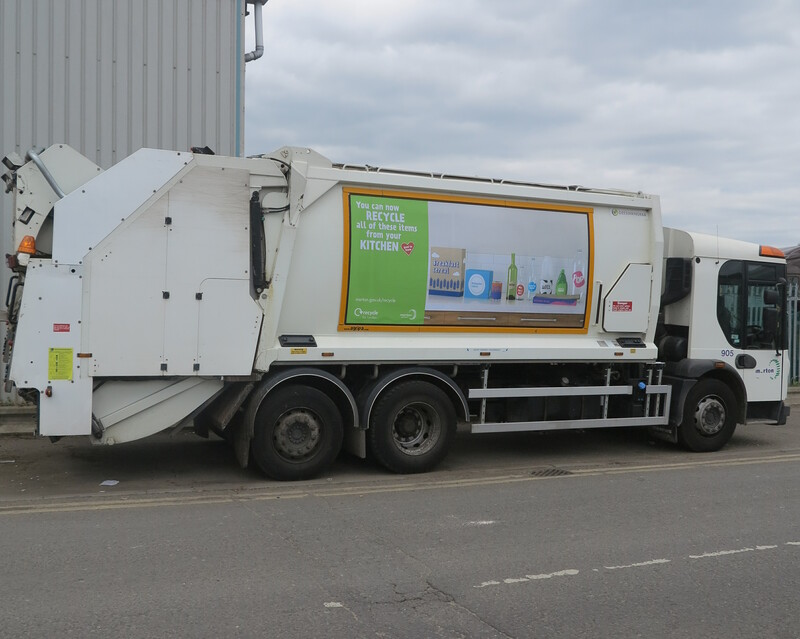 Merton’s Waste Service has been successful with their bid for funding from London Waste and Recycling Board allowing them to pay for 30 vehicle banners which aim to inspire more recycling throughout the borough. New recycling banner on a refuse vehicle. The council, through its Mega Recycle initiative, continues its work to encourage people to recycle whatever they can. Cutting the amount of waste that goes into landfill is not only good for the environment it is better value for money for the taxpayer as the council pays less in the landfill tax. Highlighting the importance of reusing materials and reducing waste, the council’s Style Junkies competition recently demonstrated that old objects, which would normally be thrown away, can be transformed into art and fashion.